Lock in a great price for The Homestead Evanston – rated 8.4 by recent guests! The hotel has a lovely “faded glory” ambience. So much nicer than shiny, new soulless places. The location, if you’re visiting Northwestern, is excellent. A pleasant and easy walk away. I really enjoy staying here when I come to visit my son who is a student at Northwestern. I like the old world charm of the hotel and the location is perfect for the campus and downtown Evanston. I did have a bit of an issue keeping my water temperature consistent when taking a shower. It would get very hot then cool down, then hot again. Outside of that I always love staying here and will continue to do so in the future. There is a much better feel here than the large corporate chains. Liked the quiet,gentle feel of the hotel. Excellent Staff. I only stayed for a night so I can not comment anymore. It’s vintage style and good location to town center and NU campus. Breakfast is good. Staff is friendly and helpful. Most of all the staff are so friendly . The lady at breakfast, and of course Judy,, who’s the best! She calls people by their name, and I really like her. She helped me get in on an extra nite when someone cancelled!! Studio was like a small apartment wuth a full kitchen. Great for long stays. The woman Judy at the desk is amazing! Friendly and helpful. Friendly staff, easy walkable neighborhood. Right by the lake! The staff was very helpful when I decided to leave. They really could not have been anymore accommodating. The Homestead Evanston This rating is a reflection of how the property compares to the industry standard when it comes to price, facilities and services available. It's based on a self-evaluation by the property. Use this rating to help choose your stay! This Williamsburg-style hotel in Evanston, Illinois was built in 1927 is 2 blocks from Northwestern University. A contemporary American restaurant is on site and traditional guest rooms include free Wi-Fi. Bright rooms at The Homestead include cable TV with a DVD player and coffee facilities. Each provides a seating area and is air conditioned. Grosse Point Lighthouse is a 5-minute drive from The Homestead Evanston. Downtown Chicago is 14.6 miles south of the hotel. Quince restaurant offers a full wine list. A daily continental breakfast is available. An exercise room is located in the hotel or guests can relax in the library. When would you like to stay at The Homestead Evanston? Featuring free Wi-Fi and a TV with cable channels, this room comes with ironing facilities and a work desk. Features a fully equipped kitchen with dining area, a separate bedroom and living area. This double room features a cable TV, DVD player and seating area. House Rules The Homestead Evanston takes special requests – add in the next step! The Homestead Evanston accepts these cards and reserves the right to temporarily hold an amount prior to arrival. Please note that parking extends to 1 vehicle per reservation. Parking is located down the street. Location and included breakfast were both great. The bed was a bit on the soft side for my comfort. This quant hotel is located right in the heart of downtown Evanston, and you can walk to nearly anything you could want or need. The hotel is NOT modern, but it is clean and comfortable. I found it rather charming, but your quarters will be smaller than you may be used to at other hotels. Presumably not the hotel’s fault but I constantly had static electricity “pings” from everything. Just more consistent water temperature in the shower as mentioned above. Bathroom not updated. Room also quite drab. No bellboy to help with luggage. Extremely helpful and friendly staff. The location was perfect for me. On the one evening which I planned to spend time in the lounge reading there was an event taking place. The water pressure was low in the sink, parking was about a block away. Have a feeling of living in a room within an old house. The facilities are old, not so comfortable and convenient in using them ( bathtub, faucets ,etc), so is bed too. Size of room is rather small despite there is kind of a walk-in closet. Small, elegant older hotel. Beautiful small bar, elegant restaurant. Best of all, a long front porch/portico, to enjoy coffee or drinks, on a leafy street with huge trees, overarching branches. 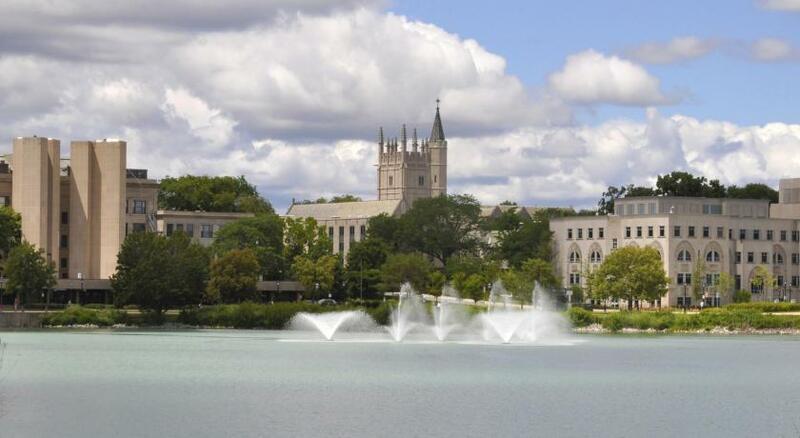 Short walk to Northwestern campus, the lake, or fine restaurants.